These are pests that aren’t afraid to fight back and must be taken seriously! Careful planning in eradication and control must take place first in order to prevent serious injury from occurring during the pest control service. We’ll treat the problem and then follow-up to ensure they’re truly gone. 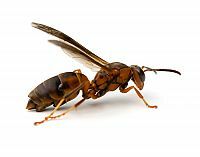 Wasps frequently nest inside and underneath eaves, inside the lapped grooves of cedar siding or corner trim, along roof lines, underneath decks and walkways, handrails, boathouses, playground equipment, etc. 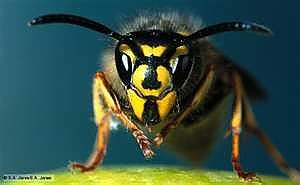 Because wasps are a heavier body weight insect, and because they don’t often drag their feet through their mouth parts the way other insects do during preening, they aren’t as prone to insecticide residuals as other insects are. Instead, the most effective means of eradication is to actually contact the wasps with the chemical (and a hot mix at that!) so that they inhale or ingest it. This is why wasp sprays contain a petroleum propellant so that the fumes provide the fast knockdown, thus providing the person doing the killing with the safety of not being dive-bombed by kamikaze wasps willing to “go down stinging”! The most basic instinct of wasps is to fly, even though they may not be able to even cling to a branch or other surface because they’re contaminated and dying.